This guide is designed to assist you in locating resources such as books, videos, articles, websites for use in the study of Music. If you need additional help, please contact the Music Librarian or stop by the Reference Desk. You can also get help from our online reference service: Ask A Librarian. Start your research by clicking on the tabs below. Search the Library's Catalog to locate books, scores, sound recordings and videos on music-related topics. Our collection includes materials written by and about composers and musicians, music theory and performance-related works. I-Share allows you to borrow books from over 80 Illinois academic libraries. You must have a current COD library card, and create an account to request books from an I-Share library. Current COD Online students can obtain a library card online. Keyword: Search by keyword to find any materials that mention a composer or performer's name in the item's description. A keyword search will give you the most results, but the results will not be as precise as an Author or Subject search. Use reference resources, such as dictionaries, encyclopedias and handbooks to learn background information on your topic. Below are some "Best Bets" covering a wide ranges of resources. Note that many of these sources are multi-volume sets. Also note that some resources are available online. Credo Reference Search over 250 topic entries on all aspects of Music. This collection includes information from a wide range of reference encyclopedias and handbooks. Articles range from brief topical overviews to extensive treatments of various topics. In the Catalog Search screen, type the names of the topics that you're interested in finding. For example, if you'd like to find a video on composer Igor Stravinsky, enter "Stravinsky, Igor" in the keyword search box, and then click search. See below for example. You can search for videos using several search types, for example, by genre, idiom, composer, musician, history, theory and geographic location. From the results page, on the left side of the screen, click on the box labeled "Videos." View your search results. Note that in the upper left corner of the screen the number of search results is displayed. Click on the title to display the location, availability and call number. 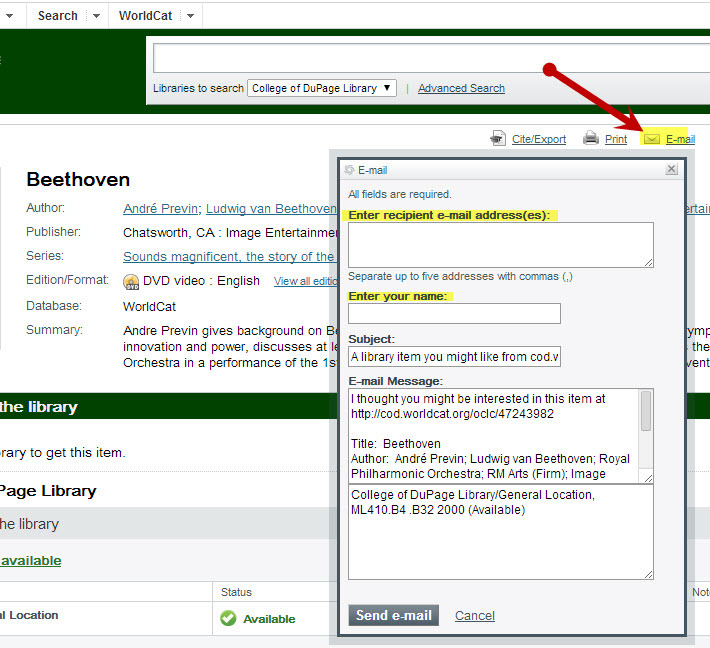 Type in the name of the composer and search in the library catalog. 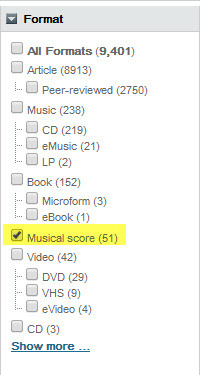 From the results page, on the left side of the screen, click on the box labeled "Musical Score." Type in the name of the artist, orchestra, ensemble, etc. 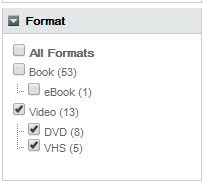 in the library catalog and click search. From the results page, on the left side of the screen, click on the box labeled "Music." Email resources to yourself or instructor by clicking on the resource and then clicking on the email link towards the top of the page. Fill in the email address(es) and enter your name in the respective boxes. Use these databases to locate articles on composers, musicians, music theory, musical styles, and more. Many of these databases offer articles from both popular and scholarly, peer-reviewed journal sources. All articles found in JSTOR and Project MUSE databases are scholarly, peer-reviewed. Academic OneFile Academic OneFile is great for both popular and peer-reviewed full-text articles from the world's leading journals and reference sources. Academic OneFile is an excellent resource for general research. Academic Search Complete contains indexing and full text for 9100 journals. 7100 of these journals are peer-reviewed scholarly titles. Academic Search Complete is a great resource for general research. Credo Reference Search over 250 topic entries on all aspects of Music. This collection includes information from 11 reference encyclopedias and handbooks. Articles range from brief topical overviews to extensive treatments of various topics. JSTOR is an archive of digitized peer-reviewed journal articles published between the 1700s to between 1 and 5 years ago. Resluts can be limited to music-related articles by selecting the "Advanced Search" screen from JSTOR's front page, and then selecting "Music" from the "NARROW BY DISCIPLINE AND/OR PUBLICATION TITLE" section. Excellent source for finding biographical information on composers and musicians. This resource also contains extensive articles on musical instruments, musical forms, timelines, index of operas, and subject guides that offer overviews of the major periods of music history, with lists of Grove articles covering important people, genres, terms, and concepts related to the period. Project MUSE offers full-text current and archival articles from 500+ scholarly journals from major university presses covering literature and criticism, history, performing arts, cultural studies, education, philosophy, political science, gender studies, and more. Updated continually. 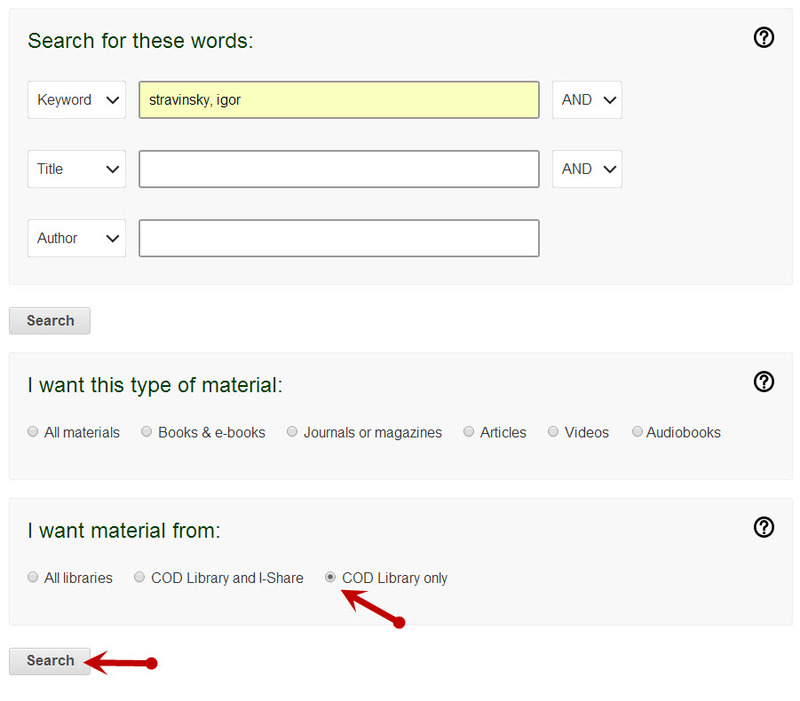 NOTE: To limit your searches to the journals available through the COD Library, check the "Only content I have full access to" box on the left side of your results page. American Music includes songs by and about Americans for listening and learning online. The range of genres includes country, folk, bluegrass, Western, old time, American Indian, blues, gospel, shape note singing, doo-wop, Motown, R&B, soul, funk, and others. 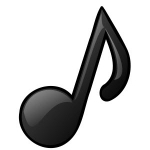 Classical Music Library is a large collection of classical music recordings for listening and learning online. Coverage includes music written from the earliest times to the present, including many contemporary composers. Repertoire ranges from vocal and choral music, to chamber, orchestral, solo instrumental, and opera. Contemporary World Music is a growing collection of recordings for listening and learning online. This collection contains genres such as reggae, worldbeat, neo-traditional, world fusion, Balkanic jazz, African film, Bollywood, Arab swing and jazz. CWM contains other world music genres such as traditional music: Indian classical, fado, flamenco, klezmer, zydeco, gospel, gagaku, and more. Jazz Music Online is a large collection of jazz music by individuals and ensembles for online listening and learning. Jazz Music Online is part of the Music Online database. Popular Music Online contains a wide range of popular music from around the world, including hundreds of thousands of tracks from major genres in pop music, including alternative, country, Christian, electronic, hip-hop, metal, punk, new age, R&B, reggae, rock, soundtracks and many more. Smithsonian Global Sound is a large collection of the world's musical and aural traditions for listening and learning online. Provides "access to holdings which include oral histories, photographs, musical and print manuscripts, audio and video recordings, educational broadcast programs, and the personal papers of individuals and organizations concerned with black music." "The collection includes many songs from the heyday of antebellum black face minstrelsy in the 1850s and from the abolitionist movement of the same period." Lists of new releases, CD and book reviews, interviews and more. Not a scholarly resource. PBS website to accompany the Martin Scorsese series on the blues. Although you cannot view the videos on the site you can read biographies and other background information about the musicians covered in the series. There is also information on the blues in the section Blues Classroom. The Library does own the series, and you can check them out to view the entire film. Nearly 100 audio files of blues and gospel music. University of Mississippi collection of early minstrel songs through the 1970's. The University of Mississippi has issued this disclaimer about some of the materials in the collection: " Many of the minstrel songs contained in this digital collection are extremely offensive. However, it is impossible to adequately understand American racial attitudes of the late 19th- and early 20th-centuries, without examining some blatantly racist ideas. Most of the music featured in this collection is not fringe material, but some of the most popular songs of their times." Not all the material is offensive however. Collections of the Library of Congress. Provides selected works by eight composers. Essays, information, recommended recordings and links to other web sites. Contains "more than 6,100 documents on 37,600 coloured scans of high quality, 1,600 audio files (music examples, audio letters) and 7,600 text files." "Classical Net features more than 9000 pages and 20,000+ images including more than 7000 CD, SACD, DVD, Blu-ray, Book and Concert reviews and over 5500 links to other classical music web sites." Four part series by noted classical musician Eugene Istomin contains videos and biographies on some of the major composers, performers, and conductors of classical music, made available through the Library of Congress. Explore multi-media resources on Bach's music, including graphics, video and texts. Listen to musicians and conductors talk about music. Some musical excerpts included. Podcasts include interviews with composers, performers and artists, as well as performances held in conjunction with art installations at the National Gallery. "The purpose of this web site ... is to make Wolfgang Amadeus Mozart's musical compositions widely and conveniently accessible to the public, for personal study and for educational and classroom use." "The scores and libretti in this Virtual Collection include first and early editions and manuscript copies of music from the eighteenth and early nineteenth centuries by J.S. Bach and Bach family members, Mozart, Schubert and other composers, as well as multiple versions of nineteenth century opera scores, seminal works of musical modernism, and music of the Second Viennese School. " Published by John Wilbye in 1598. For four, five, and six voices. A "virtual library containing all public domain musical scores, as well as scores from composers who are willing to share their music with the world without charge." A commercial supplier of sheet music that can serve as means to locating musical scores that are currently "in print." This collection contains musical scores, midi files, and musical score cover art. Vocal popular music as well violin and piano scores are included. Digital Sheet Music Project from the University of South Carolina Music Library. Provides access to over 10,000 pieces of classical, popular, and sacred music from the 19th and early 20th centuries. For items in the public domain the actual document has been scanned. Searches across multiple collections of sheet music. Some access is restricted, but much is available. Creating a login lets you save your selections as a virtual collection. Contains over 10,00 digitized pieces of music - most works are in the public domain. Includes various types of music including classical, African-American, folk and Native American. "Historical sound recordings available to the public free of charge. The Jukebox includes recordings from the extraordinary collections of the Library of Congress Packard Campus for Audio Visual Conservation and other contributing libraries and archives." Concerts, studio sessions, interviews, columns, among other offerings. Provides information about the orchestra, orchestration, composition and instruments. Information on musical genres, libraries, societies and organizations, academic job listings, and many other topics. Short explanations, pictures, and recordings of musical instruments. Audio, video, pictures, and media. Ballad operas were performed on the British stage between 1728 to 1760. They combined a comic or sentimental play with musical numbers. Publication and production information may be found here along with some audio samples. Archive includes a variety of G&S related items, including clip art, librettos, plot summaries, pictures of the original G&S stars, song scores, midi and mpeg audio files, and newsletter articles. Offers a history of the Met, brief audio segments of famous performances, and brief summaries of operas. Synopsis, full or part libretto, performance history and other information is provided. World of Opera with host Lisa Simeone brings listeners compelling performances from top American and international opera companies. World of Opera encompasses the seminal operas of the 17th century; the comic, political and social satires of the 18th century; the "bel canto" masterpieces of Gaetano Donizetti and Vincenzo Bellini; the revolutionary 19th-century works of Giuseppe Verdi and Richard Wagner; and, of course, operas in the "true-to-life" verismo style of Puccini and Mascagni. Also of interest is "10 Operas you Need to Know," which offers brief overviews of important "recent" operas. Also see the World of Opera archive. Learn about the Chicago Symphony Orchestra, including interviews of conductors and performers in the Sounds & Stories page. Learn more about CSO performers on the "About"page. News site for current music. "This collection contains more than 3000 slides, 500 photographs, 50 hours of sounds from forty-five different countries, as well as a large number of difficult to find texts that librarians, scholars, and other subject specialists have deemed important to these fields of study." "The Global Music Archive is a multi-media reference archive and resource center for traditional and popular song, music, and dance of Africa and the Americas." Users can search the entire collection of Smithsonian Folkways recordings and download liner notes. The actual music is available through Music Online. You will need a library card to access the music. In addition to the recordings, Smithsonian Folkways has a selection of podcasts and short videos, as well as radio streams. Several genres of music are represented:old-time music; country and bluegrass; folk revival; rhythm, blues, and boogie; African-American, and an eclectic mix.